7. 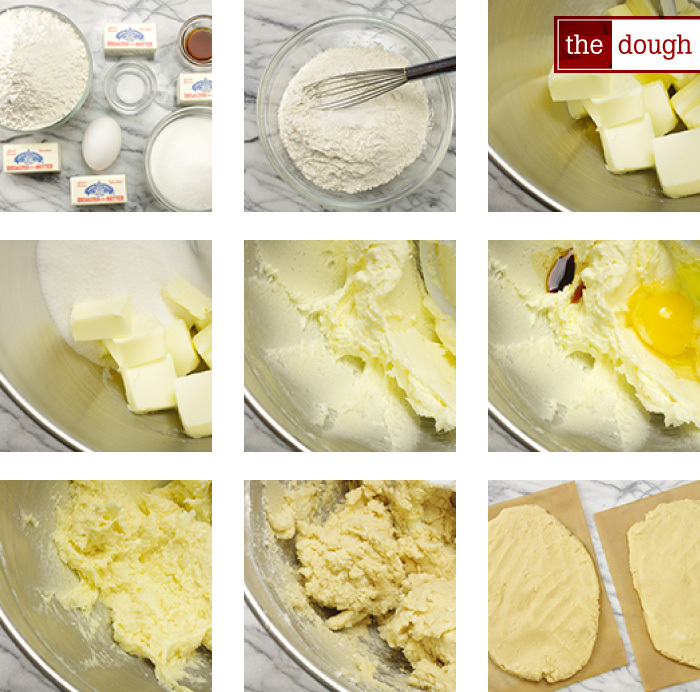 After you’ve rolled and cut the dough and the cookie shapes are on parchment-lined cookie sheets, bake them in the middle rack of your oven for 12-16 minutes or until the cookies start to turn slightly golden around the edges (smaller cookies will be done more quickly). NOTE: If you decide to bake two sheets of cookies at a time, space your two oven racks evenly in the oven and rotate the cookie sheets halfway through baking (that is, switch the position of the top sheet and bottom sheet and turn both so that the front of each sheet is at the back to promote even baking). 8. Cool the cookies completely on a rack before icing or decorating. 1. With the red piping icing, outline the hat area. Let dry for about 15 minutes, then flood the area with the red flooding icing. 2. 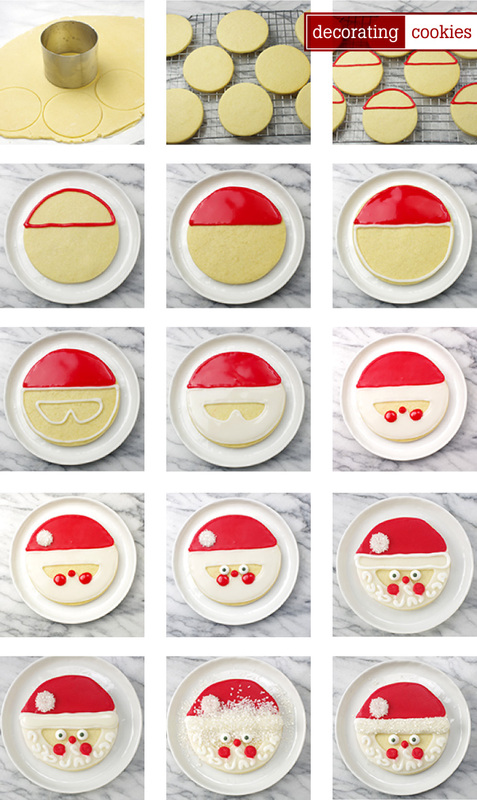 After an hour or overnight, outline the hat fur and the beard with white piping icing. Let dry for about 15 minutes, then flood the outlined area with the white flooding icing. Allow to dry several hours or overnight. 3. Pipe a pom-pom on Santa’s hat with the white piping icing, and outline the fur brim again. Flood the fur brim with another layer of white flooding icing. While still wet, sprinkle on white glitter sugar, or coarse, white sanding sugar. Allow to dry, then brush away any excess glitter. 4. 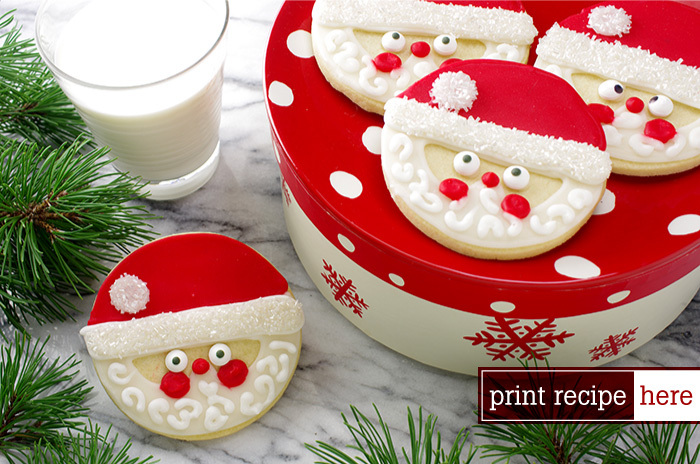 With the red piping icing, add rosy cheeks and a button nose. 5. Add candy eyes with a dab of white piping icing. Or pipe eyes with white piping icing. Allow to dry. Dot with a toothpick dipped in melted chocolate. 6. Add beard curls with white piping icing for the final touch!